388 pages | 185 B/W Illus. This book provides a first authoritative text on radiochromic film, covering the basic principles, technology advances, practical methods, and applications. 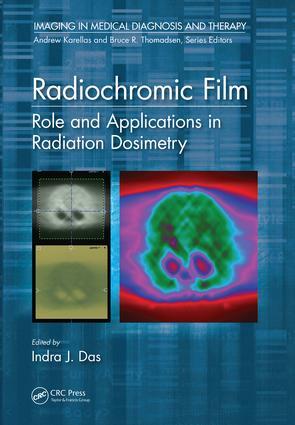 It focuses on practical uses of radiochromic film in radiation dosimetry for diagnostic x-rays, brachytherapy, radiosurgery, external beam therapies (photon, electron, protons), stereotactic body radiotherapy, intensity-modulated radiotherapy, and other emerging radiation technologies. The expert authors address basic concepts, advantages, and the main applications including kilovoltage, brachytherapy, megavoltage, electron beam, proton beam, skin dose, in vivo dosimetry, postal and clinical trial dosimetry. The final chapters discuss the state of the art in microbeam, synchrotron radiation, and ultraviolet radiation dosimetry. Indra J. Das, PhD, is currently the Vice Chair, Professor, and Director of Medical Physics in the Department of Radiation Oncology at New York University Langone Medical Center. Dr. Das is an internationally acclaimed medical physicist with expertise in radiation dosimetry, dose calculation, dose specification, small field dosimetry, treatment planning, nanoparticles, and proton beam therapy. He received his BSc, and MSc degrees from Gorakhpur University in India, followed by his Dip in Radiological Physics (DRP) from Bhabha Atomic Research Center in Trombay, Mumbai. He earned his MS in Medical Physics from the University of Wisconsin Madison, and PhD from the University of Minnesota, Minneapolis. He has previously held positions at the University of Massachusetts Medical Center, Fox Chase Cancer Center, University of Pennsylvania, and Indiana University School of Medicine. He was director of proton beam therapy at Indiana University, and adjunct professor at Purdue University, Osaka University, and Amrita Institute of Medical Science in Cochin, India. He is chair of the working group for proton beam therapy at the American Association of Physicists in Medicine (AAPM), and wrote standard of care guidelines for the American College of Radiology (ACR) proton beam working group. He is an elected fellow of Institute of Physics and Engineering in Medicine (IPEM), AAPM, American College of Medical Physics (ACMP), ACR, and American Society for Radiation Oncology (ASTRO). He is also recipient of numerous accolades including the AAPM’s Farrington Daniels Award (1988) and the AMPI’s Dr. Ramaiah Naidu Award for life time achievement (2015). He has published over 400 abstracts, 21 books/chapters and over 200 peer reviewed scientific papers. He serves on the editorial board of many radiation journals, including Medical Physics, British Journal of Radiology, and International Journal of Radiation Oncology Biology and Physics and has delivered invited lectures throughout world.